Relegation bound Horbury in high spirits. We have received confirmation of the final gradings for bands competing in the Yorkshire Regional Brass Band Championships and it has been confirmed that as of January 2011, the band will be relegated from the 2nd section to the 3rd section. In addition, it has also been confirmed the 2011 Yorkshire Championships will take place on the weekend of Saturday 5th and Sunday 6th March, with the 3rd section playing on the afternoon of Sunday 6th March. With the band rebuilding after a difficult 2009 the players and MD, Duncan Beckley are in confident mood for success in 2011. The Band has recently set up a Friend of Horbury Band scheme. At a cost of £20 per annum friends receive the band newsletter, an invite to an annual concert and a regularly updated list of engagements. To become a friend of the band please contact Arnold Tattersfield, or use the Contact us Link on the front page of this site. How about giving it to a grandparent as a birthday present? 2009 has been a challenging year for the band but things look very positive heading into 2010. At the start of the year the senior band were without a conductor and had many vacancies around the stand for the Yorkshire Areas but in true Horbury style they pulled it together and came out with their heads held high. A long and testing few months were to follow whilst the band failed to secure a Musical Director on a permanent basis. Tom Greatorex played a big role in keeping the band together, conducting at various jobs throughout the year. In October Horbury recorded a major coup by securing the services of Duncan Beckley as Musical Director until March 2010. The band is now going from strength to strength and is looking forward to a successful year. The Youth Band has seen some major changes this year. The change to the categories in the National Youth Championship Finals saw the age limit dropped from 20 years to 18 years old. This meant a few of the more experienced players had to ‘retire’ from the band. The younger players did the band proud, claiming a ‘Bronze’ award at the championships. The Christmas period came around very quickly and the senior band were on hand to support the younger ones through it. Tom is very confident that 2010 will be a fruitful year for our young stars. The Intermediate and Learner bands have had a productive year with many players improving and working their way up the bands. This year it will be the intermediate band travelling to Manchester for the Championships in April due to a change in the set up of the competition. We wish everyone the best of luck in 2010. The small Yorkshire town of Horbury is proud of it's local brass band which has performed at many festive occasions for well over a century. Horbury Brass Band as it was originally known was established in 1866. The band was kept busy with all the school feasts, carnivals and festive occasions of those days. Many contests were entered with excellent results, the most notable victory being the one time at Crystal Palace. As a result of this event the band adopted a new title, Horbury Victoria Prize Band. There have been hard times along the way and none more so than on the 20th of February 1984 when fire completely destroyed the old wooden bandroom in Peel Street, which had been the band's home for many years. However, after some 6 months of hard work raising money and keeping morale high, a new bandroom was designed and built on the old site. In more recent years successful competition results have been awarded to the band. In 1998 they were awarded first prize in the Ripon Music Festival Entertainment Contest held in the town's Cathedral. 1999 brought further fortune with a 1st prize again at Ripon and a win later in the year at the Malton Brass Entertainment Contest. And in March 2000 the band were runners up in the Yorkshire Area Finals which qualified them to take part in the Millennium National Finals in the Royal Albert Hall, London. Naturally there have been many changes over the years and today the accent is very much on youth. 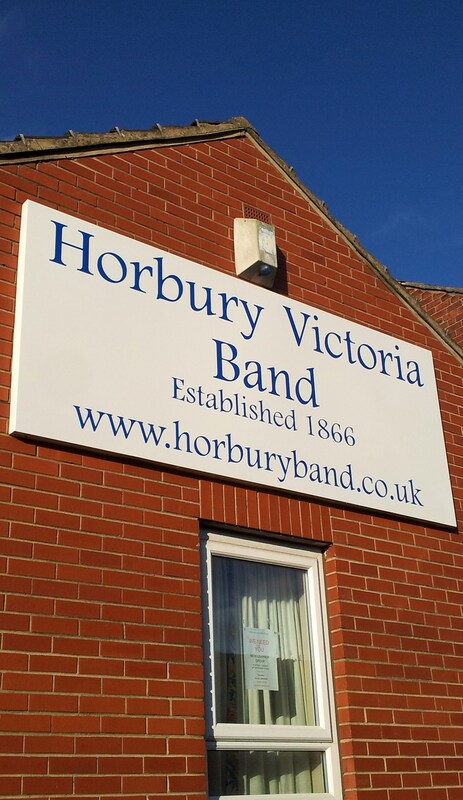 The Horbury Victoria Band now consists of a Senior Band, Youth Band, Intermediate Band and Learner Section, in all numbering almost 100 members, backed by a very willing and hard working Committee. The Senior and Youth Bands are committed to maintaining high performance standards in all their contest and concert engagements and they look forward to working hard as a team for the future.